Are you Looking for the perfect snack for your next gathering or a delicious treat for your holiday exchange? I have you covered – homemade caramel corn. A delicious balance of sweet and salty, this caramel corn is ridiculously easy to make, keeps well for several days (if it lasts that long! ), and feeds a crowd. I’ll keep this post short so you can go make a batch stat. Enjoy! What is your favorite holiday treat? Let me know below! I use my air popper to prepare the popcorn. You need about 20-22 cups of popcorn total, which is about 1 cup of kernels (popped in 2 batches in the air popper). I would assume you could also buy pre-popped popcorn, pop it on the stove, or use microwave popcorn, but I have not used these methods myself. When I make the caramel topping I keep the popcorn in a large roasting pan in the oven. This keeps the popcorn warm and makes mixing the caramel easy. Put popped popcorn into roasting pan and store in the oven while you make caramel sauce. In a large sauce pan over medium heat combine butter, brown sugar, corn syrup and salt. Bring mixture to a boil, stirring constantly. Once mixture reaches a bubble, continue boiling for four minute without stirring. After four minutes, remove caramel from heat and stir in vanilla and baking soda until smooth. Mixture will bubble quickly. Stream caramel mixture over warm popcorn, stirring to combine. 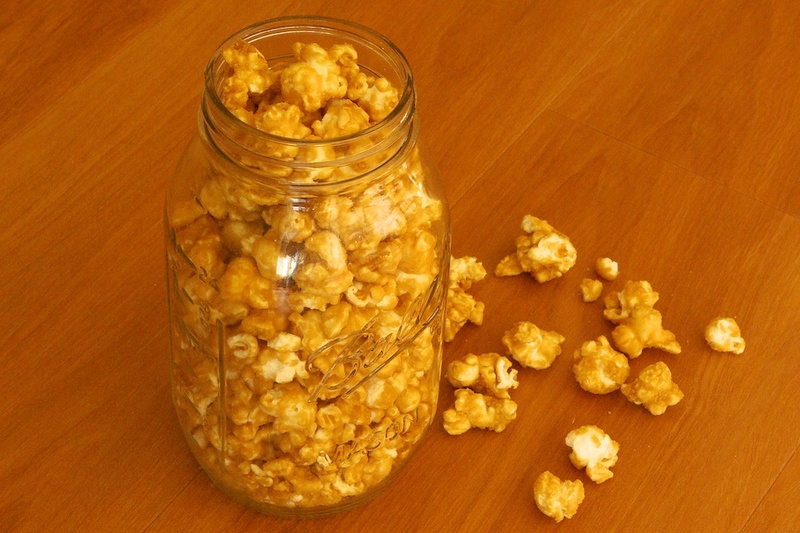 Gently stir popcorn until all kernels are covered with caramel. Return popcorn to oven for 15 minutes. After 15 minutes, remove popcorn and stir. Repeat this step an additional three times for a total of one hour in the oven. **Note – If your oven runs hot, your last 15 minutes in the oven may need to be shortened to 10. I usually remove mine after 10-11. Transfer popcorn to a cookie sheet and allow to cool completely. Once cool, break up any large clumps and enjoy!